Interesting. I think I'd heard of it but can't remember reading it, and I'm sure the Ugly-Wugglies would have rang bells. Actually, they do ring bells but only as a term used by my Mum and aunts for bugs and other creepy crawlies - and that may have been picked up from reading the book, since they were born in the 1900-1915 era. The only other Nesbit I've read is Five Children and It, which also had some strangeness about it... although come to think of it, I may have read the Railway Children since I remember doing something with the story at school (age 12-13) and that would have been before the Jenny Agutter film, since we're the same age! The author bio does say that she wrote a lot of fantasy. So maybe in 1907 that meant strangeness. Although I enjoyed reading The Railway Children I was never really tempted to read any more Nesbit. I love the cover picture that you have (even though it isn't the edition that you read!). It is a nice cover! The one I had also had good illustrations. Thanks for stopping by! I wonder how creepy this book would have seemed back when it was published? It is always interesting reading older books and wondering if some of the material would fit in better with the context of the time in which it was written. I do wonder. The 19th Century was pretty into creepy--think Poe, not to mention the really dark underside of so much Dickens, and the Gothic craze. Definitely a gothic feel to this. Hi! Xyra from Tea Time with Melody Q stopping by from the Kid Lit Blog Hop. Thank you for a great review. The author's name rang a bell with me, but I have always had a hard time matching some authors to the titles of their works (most often this happens with poetry). I/we reviewed The Railway Children last year. I will have to check this one out. With regard to the creepiness (and I haven't read this just yet) I think modern readers try to sterilize everything children see and hear. Perfectly acceptable, but sometimes we go too far. I am surprised by how many older people who grew up reading the Laura Ingles Wilder books or Charlotte's Web think they are too dark for children. Those books depict life as it was (and is). In this case, you are discussing fantasy not history so having a child who is already worried about monsters under the bed and in the closet read about ugly-wugglies might not be a good thing, but perhaps whatever the outcome is in the book with the UW will help the reader in the present deal with their own. Plus as you noted early literature was dark - look at Jane Eyre and Wuthering Heights. Thank you again for this review. 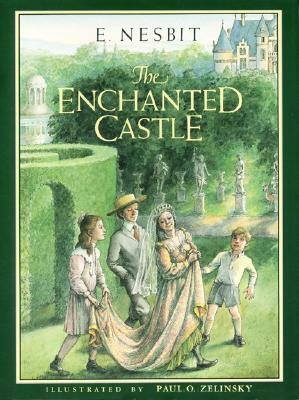 I'm adding The Enchanted Castle to my to be read list. I don't know...a lot of children's lit these days has some VERY serious themes. I think it was the gothic aspect of this that took me by surprise, because that's not what most modern fantasy is like. But on reflection, it makes perfect sense. Makes me think about the degree to which fantasy grew out of gothic horror--look at Frankenstein, etc. I agree that some of the themes now are very serious. I remember teaching Go Ask Alice or a book similar. And recently I read The Vanishing Game - it was pretty cool until the end when a fantasy chase novel turned into psychokinesis evidenced through mental health issues. Still a very interesting book, but the twist became extremely serious and I don't remember there being a resolution. Do you find it interesting that some feel young readers can't handle the reality of pig farming, but they should be able to handle books on depression, abuse, etc.? I'm not in favor of censoring or hushing topics - that is a travesty - I just find it interesting the dichotomy of shoulds and shouldn'ts. I agree--both about not censoring (though some things just seem like they don't belong in a child's mind. Maybe some kids have to deal with them, but that's not necessarily a reason for putting them in kids' books), and about the odd things that they do get sheltered from. I wonder if some of the descriptions in Little House in the Big Woods would disturb today's kids (or parents) who have never thought about the reality of eating meat. I volunteer at the Goschenhoppen Folk Festival which features home skills and trades from the 18th and 19th centuries. The kids flock to watch the butchering demonstrations while many adults make "ick" faces. :) And these are the little kids - the ones who may not be ready to read a long book like Little House in the Big Woods. The middle schoolers are less likely to go watch. It is an interesting study. Thanks for sharing this one, Rebecca. I've not heard of it. I hadn't either. I just found it in the heap when sort the books, and snagged it because I recognized the author.